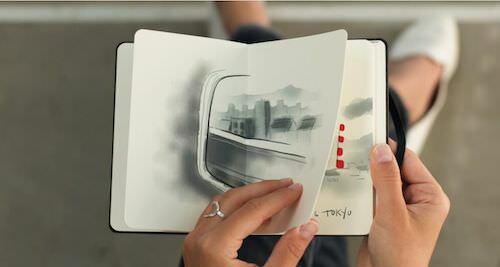 There are many drawing, painting and writing ‘notebook’ app for the iPad. One particular app, Paper by 53, has gotten a lot of attention. It isn’t an app for taking meeting notes in long hand but great for sketching out meeting results. It doesn’t have extensive filing, but paper like pages flip easily within a group of sketch books. There isn’t one hundred different pen types to choose from, but the instruments are what are needed and there is a color mixer available to create your own perfect shade. It is simply, simple while having everything a drawing person needs. 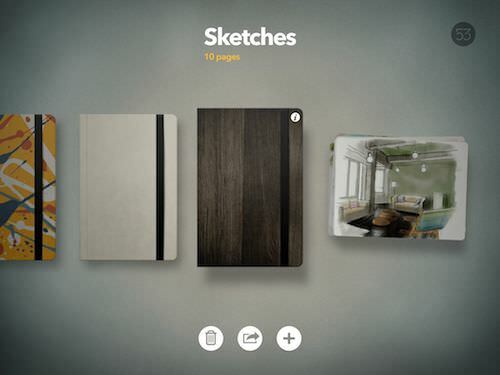 Drawings can be shared with other apps or out to a Web site so sharing one’s creations is easy. Paper does feel like working on paper, without having a lot of paper book lookalike art. 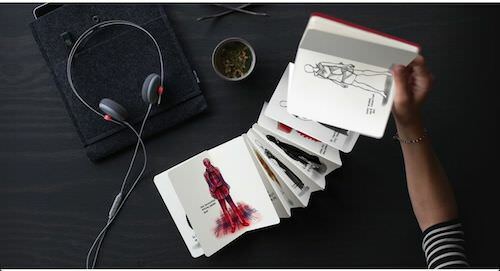 So, it seems natural that there should be a way to get a book of drawings and sketches into a physical book. What a great gift from an artist or share around the office for collaboration. 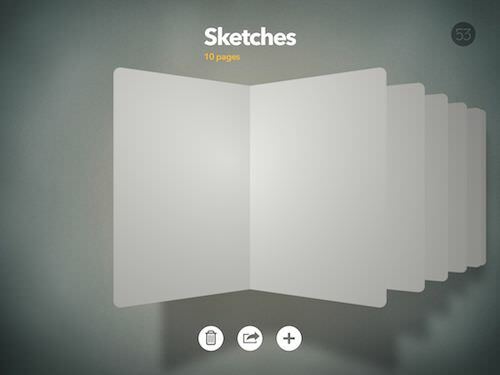 As a refresher, Paper by 53 offers a row of sketchbook like graphics which you can name and change the cover art of. Each book, opens to white pages that turn like an accordion bellows. Like mentioned above, there is a small selection of drawing instruments, each can use either colors from a small chooser as well there is a ‘mixing’ option to create a unique color. 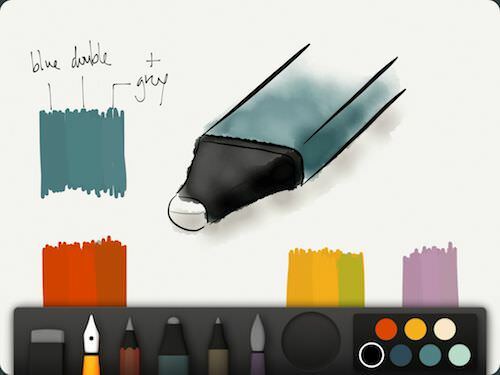 Some drawing devices and color options are an in-app up charge. In the right hands, are is created. Most often for us, we have a lot of fun idea sketches that are equally as important but less about what anyone would want hanging on their walls. 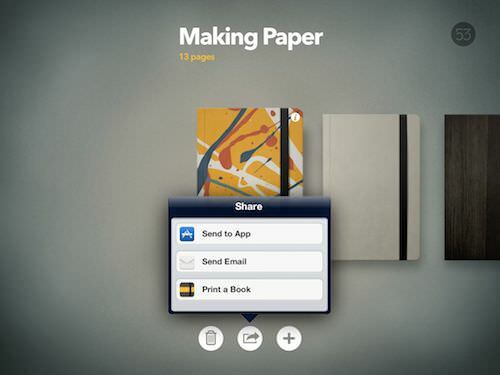 Included in Paper is a batch of user submitted art to browse through. When a book of drawings or painting is in a state to share, use the share picker on the booklet overview screen to choose to have printed. 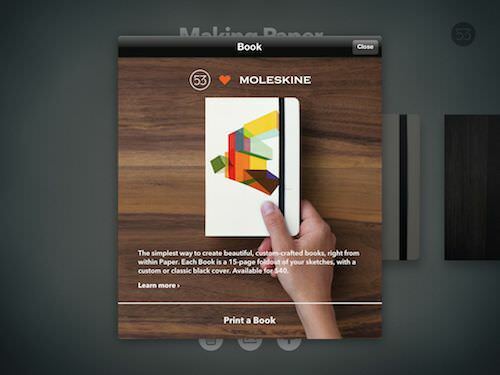 The printing of Paper books is actually handled by the folks at Moleskine. There is a charge to have printed, and a limitation of up-to 15 pages. Which is actually a nice amount where we don’t send extra junk as well we don’t feel forced to fill extra pages. Like the digital form factor of flipflop folded pages, the print book version carries the form into the physical world. For the full effect of pen/brush on paper, the folks at 53 have introduced their own stylish stylus, the Pencil. Available in wood or dark graphite, the stylus communicates with the Paper app via Bluetooth, power by a USB rechargeable battery.